Walter “Gulle” Oesau was born on 28 June 1913 at Farnewinkel in the Dithmarschen region of Holst. He enlisted in the army in 1933 and served in an artillery regiment. By 1934 he had become a Fahnenjunker and was undertaking flying training with the Deutschen Verkehrsfliegerschule. On completing his flying training he was posted to Jagdgeschwader “Richtofen”. Leutnant Oesau was one of the first fighter pilots to join J/88 in Spain in April 1938. Here he served with 3. J/88 and gained nine victories. He became one of only 27 recipients of the Spanienkreuz in Gold mit Brillanten . He was also wounded in this campaign and was awarded the Spanish Wound Badge. On 1 March 1939, Oesau joined the Stabsschwarm of I./JG 2.  On 15 July, Oberleutnant Oesau was appointed Staffelkapitän of 1./JG 20 which was later redesignated 7./JG 51. Oesau gained his first victory of World War 2 on 13 May 1940. He ended the French campaign with five victories to his credit. On 18 August 1940 he became the fifth Luftwaffe pilot to reach 20 World War 2 victories, bringing him the award of the Ritterkreuz. 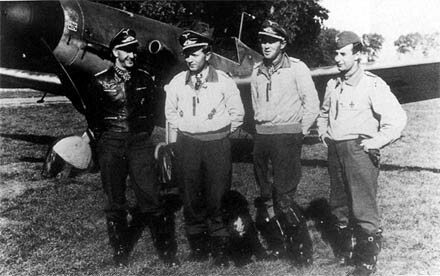 On 25 August 1940, Hauptmann Oesau was appointed Gruppenkommandeur of III./JG 51. On 11 November 1940, Oesau was appointed Gruppenkommandeur of III./JG 3. He led the Gruppe to the Eastern front where the invasion of Russia was launched. He recorded his 40th victory on 5 February 1941. On 6 February, he was awarded the Eichenlaub (Nr 9). He recorded his 50th victory on 30 June. He claimed five enemy aircraft shot down on 10 July 1941 for his 64th to 68th victories. He recorded his 70th victory on 11 July and his 80th on 17 July. On 15 July his victory tally had reached 80 and he became only the third man to be awarded the Schwertern. At the end of July 1941 he was recalled to the Western Front to take command of JG 2. He recorded his 100th victory on 26 October, only the third Luftwaffe pilot to reach this landmark. He was forbidden to fly further combat missions, his combat experience and leadership qualities being considered too valuable to risk. A series of staff appointments followed, including being appointed Jagdfliegerführer 4 Brittany. On 12 November 1943, Oberst Oesau returned to combat when he was appointed Kommodore of JG 1 following the death of Oberst Hans Philipp (206 victories, RK-S). He soon added at least 14 victories against the USAAF formations of B-17 and B-24 four-engined bombers. On 11 May 1944, Oesau, leading three aircraft of the Stabsschwarm, took off from Paderborn to intercept Allied bombers raiding north-eastern Belgium and Luxembourg. During his attack on the bombers he was bounced by escorting P-38s. In the ensuing combat he was shot down and killed in his Bf 109 G-6/AS (W.Nr. 20 601) “Green 13” near St Vith. 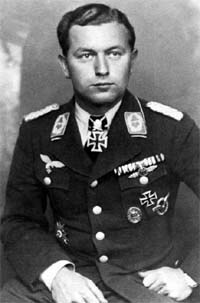 “Gulle” Oesau scored 127 victories in over 300 combat missions. 9 victories were scored during the Spanish Civil War, 74 were scored on the Western front including 14 four-engined bombers (one B-17 as engültige Vernichtung) and 44 over the Eastern front.